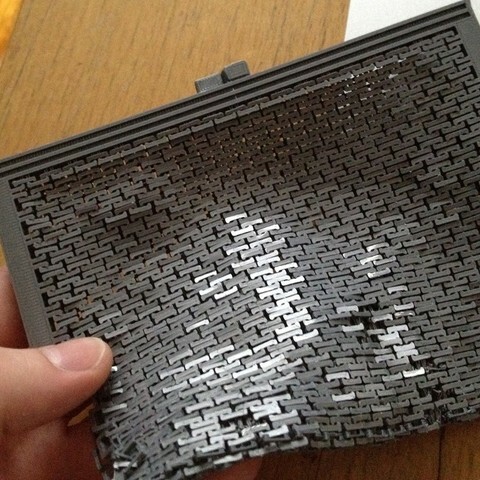 A printable clutch (purse, evening bag, etc) for desktop 3D printers. I've been a big fan of Zomboe's things, and have been eyeing his chainmail designs since I bought my TOM last year. 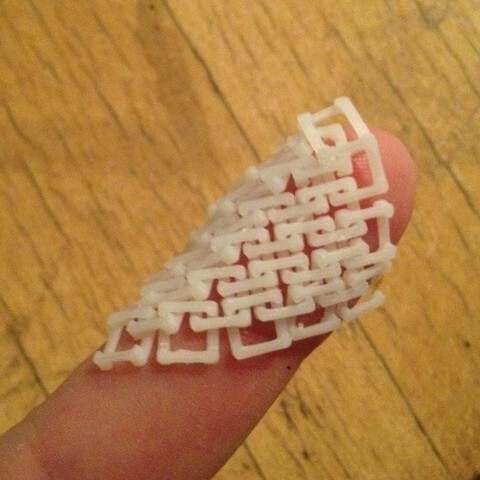 There are lots of 3D printed fabric applications for pro-grade printers on shape ways, etc, but not for use on reprap or makerbot style printers. Building some awesome and wearable feminine accessories has been on my to do list for awhile. Functional purse that will hold an iphone. Attractive and durable enough to actually use. I did not succeed on these counts. This project is less a work in progress, than an abandoned proof of concept. But, it's time to get it off my hard drive and out on the web. I expect to try again, with some lessons learned. This took 24 hours to slice in RepG. That's longer than I want to wait, and too long to iterate quickly. I either need to simplify the geometry somewhat, or use a newer and faster slicer. It's difficult to get every corner to stick to the platform, especially with a second extruder interfering and prying up a loose ends. Aggressive solutions like applying ABS slurry to the platform result in a less than desirable surface finish, and a lot of kapton tape to peel off the print. One missing square, and the print is ruined. There are about 5 holes in my print. I haven't solved how the sides go together. Currently, I think a blanket stitch with plastic lacing used in kids' friendship braclets or embroidery floss should suffice. But it's not a great solution. To be functional, this design really needs a chain or wristlet loop. I could make a nicer looking design if I altered my approach from no-glue-snap-together, to allowing multiple pieces. The hinge works well, but needs to be a little beefier to hold up. I was happy with how pretty and shiny the fabric looks. With a more attractive shape and clasp, I'd wear it. There are cool options for textile prints with dual extrusion if I could just get everything to stick better. The "fabric" only bends in one axis on each side, which you should take into account if use it in another way. I printed this very slowly, in attempt to help adhesion - 15 or 20 mm/s I think. The piece is designed for .2mm layer height, though .1mm should also work well. I printed with 5% fill, which wasn't sufficent, and the clasp snapped when I was stress testing it, I would think 25-50% should be better. If you're going to give the print a try, try the test swatch first to adjust settings if necessary. Update: 27SEP12 - Realized I uploaded the wrong source (DWG) file - file I included was missing the clasp. New file uploaded.